The best way to bulk crop photos is to use a photo scanning software like AutoSplitter. This program has been made with scanning in mind, but you can certainly use it to crop any other image as well. The software can recognize rectangular shapes over a uniform background and will automatically crop them and save to individual files. Many people scan photos in inefficient ways. They put one photo on the document window at once and scan it slowly. Then save the image, open it with an image editor software and try to crop it the best they can. Most image editors cannot make a skewed crop, so people either settle with a crop where the photo is not straightened, or they cut off some of the photo to hide the nasty edges. Also, it is more efficient to scan multiple photos at once - in bulk - as most scanners can fit 3-5 photos easily on the scanning surface. Why would you not use all the surface you have? Of course you want to. As you can see in the screenshot at the left, 5 photos have been fed into the scanner. They have been scanned together at once, then autodetected and cropped in a few seconds by AutoSplitter. If the user was happy with the results, saving the photos is just a single click. Scan multiple photos at once, finish earlier. The scanning DPI information is preserved inside the output images to make reproduction (printing) at the correct size possible. The software has several features to further speed up your work. You can use the 4-corners method to scan: by enabling the preserve splits option you can skip the detection phase: always put your photos into the corners, detect their positions only once, then reuse these positions several times. 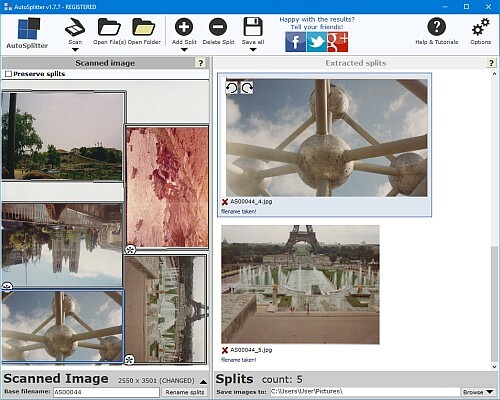 You can also open image files that you have scanned previously with multiple photos in them. You can open many of these pre-scanned files at once. Give AutoSplitter a spin and see how efficient it is.